Successfully Added 802.11N Wireless USB Adapter - Compact Edition to your Shopping Cart. 802.11N Wireless USB Adapter - the easiest and most convenient way to gain access to high speed "N" wireless internet, along with backwards compatibility for the 802.11b/g standards. This new Compact Edition is smaller and more portable than ever, and also includes internet sharing, which will turn your computer/laptop into a wireless router for other WiFi-enabled devices to connect to. 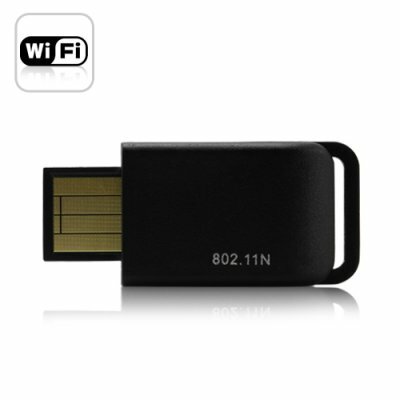 This convenient 802.11N Wireless USB Adapter provides users with the fastest available wireless internet connection without the need to buy a new computer or go through the hassle and expense of trying to upgrade existing computers. Simply install the software, plug in the Wireless USB Adapter, and you gain instant access to any nearby 802.11 N/G/B wireless networks. Station Mode: The standard way to connect to your home router or any WiFi network, just plug in the 802.11N Wireless USB Adapter and go. The included utility software will show all nearby available wireless networks up to 100 meters away when indoors and 300 meters away when outdoors (depending on weather and environment). This wireless USB adapter supports the 802.11B (11 Mbps), 802.11G (54 Mbps), and even 802.11N standard, which is many times faster and provides an amazing 150 Mbps data transfer speed. Access Point Mode: Create your own wireless access point - this Wireless USB Adapter transforms your computer/laptop into a wireless router for other WiFi devices to connect to. Now you can go online with your laptop in your bedroom, use WiFi on your cell phone, or update your PSP's firmware - using only your home's wired (Ethernet) connection! This Wireless USB Adapter also lets you to set up data encryption and network authentication, so only those you allow have access to your network. The Compact Edition 802.11N Wireless USB Adapter is in stock now and available for single piece and bulk orders. Click "Add to Cart" now and we'll express ship you out a sample within 24-hours! Brought to you from the leaders in China factory direct wholesale electronics - Chinavasion.